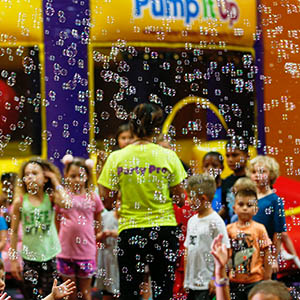 Add our amazing bubble machine to any party. The bubbles start blowing in arena B. Combine the bubbles with GLOW experience for only $40. Save $10! Add our amazing GLOW WARS to any party and let the fun begin! 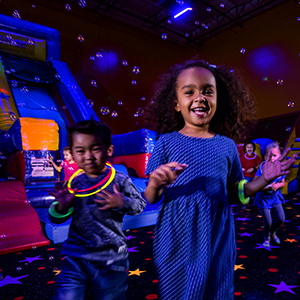 This experience includes glow lighting, glow bracelets and the use of GLOW Ball Shooters. The kids and parents are easy targets as the soft pong balls glow in the dark soaring through the air.! Everyone can get involved even the parents! This all happens in the second arena. Plus the birthday child gets to take home their very own GLOW SHOOTER! $50 add on charge for any party! Bring your friends to jump in their pajamas! Great add on for early morning party or late evening. Or it just works for any party! You will receive the GLOW Experience in Arena B. 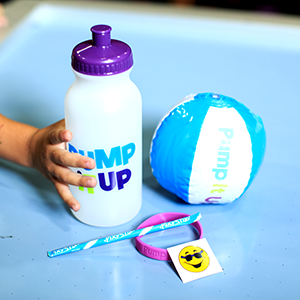 All the kids will get a glow in the dark bracelet. In the party room you will enjoy root beer floats and the birthday child will take home a pillowcase signed by all their friends! ONLY $45 for any size party. Add more character to your party, personalize your party even more with our themed paper goods! Tablecloth, cake & pizza plates and napkins. 25 kid package $29.99.